Although the 2015-16 season has yet to officially get under way, let’s take a quick look ahead to what projects to be yet another incredibly busy, and exciting, year in the NHL. At the moment, a number of highly skilled NHL stars are set to become Unrestricted Free Agents, all of which are in line for significant pay raises. However, in many cases, the financial situations of a given team complicates what would otherwise be the incredibly easy decision to re-sign such players. As a result, the option to trade players of immense value arises despite their proven on-ice abilities. As the 2015-16 NHL season approaches, there are five particular star players who find themselves in this situation. All five of these players deserve long-term contracts of increased monetary value, yet could be forced out of their current Teams if contractual agreements are unable to be met. Entering the final season of a five-year, $29 Million contract signed with the Chicago Blackhawks in February of 2011, Brent Seabrook is a pending Unrestricted Free Agent. As a result, his looming contract status could force the Blackhawks into moving Seabrook, who based on their tight financial situation, will be hard pressed to re-sign Seabrook to a contract extension reflective of his on ice capabilities. A veteran of 10 NHL seasons, all of which have come with the Blackhawks, Seabrook is regarded as one of the top defensemen in the entire League. A three-time all-star and three-time Stanley Cup champion, Seabrook is well known not only for his strong defensive play, but also his strong offensive abilities. An intimidating force at 6 foot 3, 220 pounds, Seabrook has compiled an impressive 318 points across 763 career games, including 71 goals, indicating his clear offensive flair. As a pending free agent, Seabrook will certainly demand upwards of $6 Million per season in his next contract, a cap hit which will in all likelihood be impossible for the Blackhawks to afford. As a result, it is highly likely that Seabrook will be on the move prior to the conclusion of the 2015-16 NHL season. Stumbling into the final season of a seven year, $57.75 Million contract, Eric Staal’s play has regressed over the past few years in Carolina, where he will begin the 12th season of his career in 2015-16. A pending Unrestricted Free Agent, trade rumors have been swirling around Staal of late, who if traded could fetch the Hurricanes a package of tremendously strong young players as well as draft picks. Set to surpass the 900 game milestone this coming season, Staal has long been an elite offensive player in the NHL, having scored 742 points and 312 goals thus far in his career. A six-time all-star, Staal, at the age of 30, has plenty of hockey ahead of him and can still be a strong contributor both offensively and defensively. The Hurricanes can certainly afford to re-sign Staal, however, a breath of fresh air could be the best option for both Stall and the Hurricanes franchise. In 2014-15, Dustin Byfuglien enjoyed arguably the greatest season of his NHL career. Not only was he productive offensively, scoring 18 goals and 45 points from the blue-line, but Byfuglien was also dominant physically, punishing opposing players with his incredibly strong defensive play. However, Byfuglien too is a free agent following the 2015-16 season, and is undoubtedly one of the top players set to hit the open market. A Stanley Cup champion in 2010, Byfuglien is a four-time all-star who currently retains a $5.2 Million cap hit. At the age of 30, Byfuglien also has plenty of hockey ahead of him and should draw significant interest, as well as a pay raise, in his upcoming contract. At an intimidating 6 foot 5, 265 pounds, Byfuglien is and incredibly imposing player. However, he has also displayed all of the tools of an offensive force, having scored 344 points and 133 goals in 597 career game, production which has made him a highly sought after commodity. A two-time Stanley Cup champion, Anze Kopitar is arguably one of the best two-way forwards in the NHL today. In his nine year NHL career, all of which have come with the Los Angeles Kings, Kopitar has been a model of consistency. On a yearly basis, Kopitar can be expected to score over 20 goals and approximately 70 points. Further, he is frequently amongst the top centre-ice men in the League in the face-off circle, as indicated by his 53% success rate over the past four seasons. A four-time all-star, Kopitar’s current contract, a seven-year, $47.6 Million deal signed in October of 2008, is set to expire following the 2014-15 NHL season. With a current cap-hit of $6.8 Million, it is safe to say that Kopitar deserves a contract with a similar yearly salary, if not a slight pay raise, in his next long-term contract. Despite a reportedly significant gap in current negotiations, Kopitar has expressed his desire to remain a member of the Los Angeles Kings. However, whether a deal which satisfies both parties can be reached remains to be seen. As a result, if the Kings and Kopitar fail to come to an agreement, Kopitar could quite possibly be traded prior to the conclusion of the 2015-16 season. Without question the most valuable player set to become an Unrestricted Free Agent in 2016, Lighting forward and Team Captain Steven Stamkos could be on the move out of Tampa Bay in the immediate future. A former 60 goal scorer, Stamkos is in line for a significant pay raise following the upcoming season, whether it comes with Tampa Bay or not. A five time all-star and two-time Rocket Richard Trophy winner as the NHL’s leading goal scorer, Stamkos’ current cap hit of $7.5 Million is high in League terms, yet is low in comparison to his high-end skill and elite offensive production. Signing a 25 year-old center with 276 career NHL goals under his belt would appear to be a sure thing, however, Lighting General Manager has yet to successfully ink Stamkos to a new contract, as serious contract talks between Stamkos and the Lightning have yet to take place, although minor discussions quite obviously have. 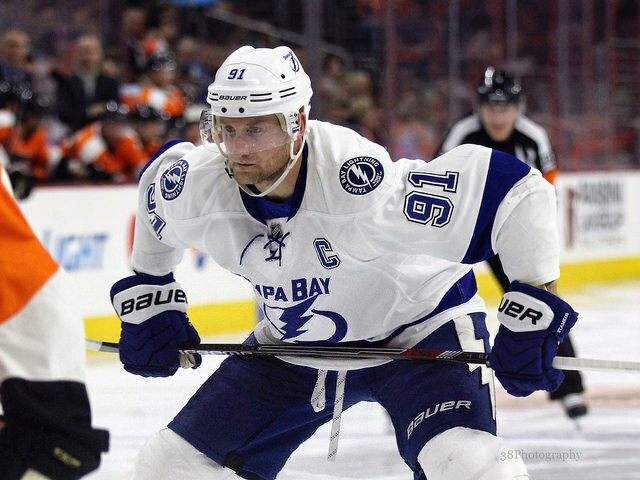 However, according to Stamkos himself, he is in no rush to get a deal done, and insists it will not interfere with his preparation for the upcoming NHL season. 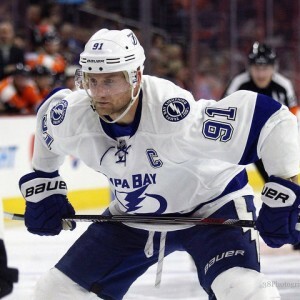 Although both sides would clearly like to come to an agreement sooner rather than later, trade rumours have begun to swirl around Stamkos, who is not only expecting a substantial pay raise, but could be traded by Tampa Bay if the two parties fail to come to a long-term agreement.